Over the long weekend my friend, Andy, and I went to the Castle River Rodeo Grounds to take part in the biggest whitewater festival in Canada, the Three River Rendezvous. My decision to go wavered when I read that the weather forecast predicted cool temperatures, variable cloudiness, and sprinkled showers. Luckily we pressed on and, as it turns out, the weather wasn’t actually that bad, and for most of the time, it was actually sunny — I even got a little burned on my face. Unfortunately tragedy struck on Sunday night. After we had returned from our trip running the Five-Alive feature on Carbondale River a couple of times, Chuck Lee, the organiser of the event broke the news that one of the participants had been taken to the hospital in an ambulance. He explained that a group of kayakers were going over Lundbreck Falls and that on this particular run the boater was held under the falls for several minutes. He was revived once or twice but that’s all he let us know at the time. He emphasized again the need to always be vigilant and to remember that these kinds of things don’t just happen in other places, they can happen here too. We held a moment of silence in respect for the victim. It was a sobering thought because I had never heard of anyone getting caught in the flow of water under the falls, and to think I, myself, have braved the 12 meter drop and walked away without so much as a scratch. 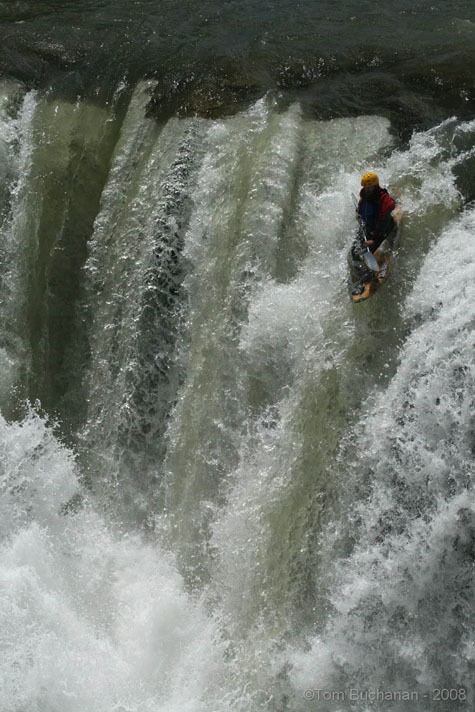 Jeff Milner going over Lundbreck Falls in June 2008. I found out later that night who was involved in the accident. I had hoped that it would be someone that I didn’t know but that’s not how it turned out. His name is Jaron and I had bumped into him just the morning before at the put-in for the Upper Castle run. I have paddled with him and his twin brother Dave a couple of times over the last two years. He’s the one in the yellow and orange boat, yellow jacket, and blue helmet. His twin brother is also in the video. I didn’t know him that well, but it was obvious that he had a passion for kayaking. Both he and Dave are the kind of enthusiastic friendly people that you want to spend a sunny day with floating down the river and enjoying nature. I remember talking to Dave for a long time about his decision to become a teacher and although I have many other influences for my decision to go back to school, it was that conversation that tipped me over the edge. Kayaking isn’t always considered an extreme sport where you expect to hear about someone dying but every year there are a few news stories where someone drowns in a river. Almost always they are inexperienced or not wearing PFDs, or there is alcohol involved somehow so Jaron’s death comes as a great shock to the paddling community. Previous PostPrevious iPod Photo or Apple Stock?